Discussion in 'B4J Tutorials' started by Erel, Nov 27, 2017. The latest IDE update adds support for grouping files and modules. You can add groups with a right click and you can move files or modules by dragging them to the new group. The most important point is that the files or module files are not really moved. Groups are not folders. They are just used to organize the resources inside the IDE. An important new feature is the ability to reference code modules instead of copying them to the project folder. This feature makes it much easier to share modules between different projects, including projects of other B4X tools. Copy to folder: Copies the modules to the project folder (same as the current behavior). Link - relative path: Adds a link to the modules with a relative path. Useful when the folder is under or close to the project folder. 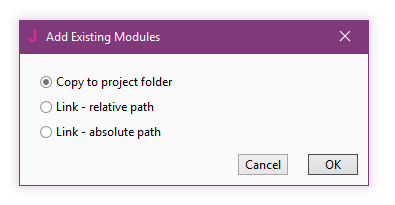 Link - absolute path: Adds a link to the modules with an absolute path. 1. Open Windows Explorer and navigate to the target folder. 2. Drag the modules from the modules tree to Windows Explorer. You can also copy and paste them. 3. Drag the modules back from Windows Explorer to the modules tree. The new modules will replace the existing modules. Note that all modules are monitored for external changes and are updated automatically when the file changes. You can undo the changes. The shared modules feature, set under Tools - Configure Paths, still works. If a linked module is not found then the IDE will look for it in the project folder and then in the shared modules folder. jimmyF, BillMeyer, Raphael da Costa Peret and 5 others like this. 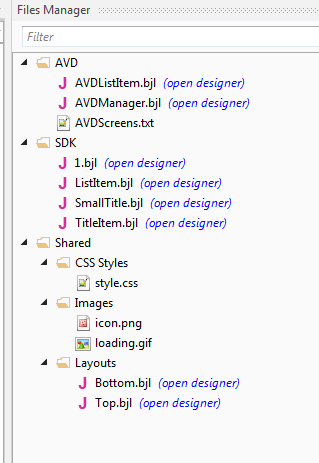 In my version in appears that this applies to the "Modules" window rather than "Files" window !? This is the wrong place to post this question. Anyway, these are two different tabs. If you don't see the Modules tab then click on Ctrl + E and it will appear.